A WORD TO THE WISE: BUY THIS! 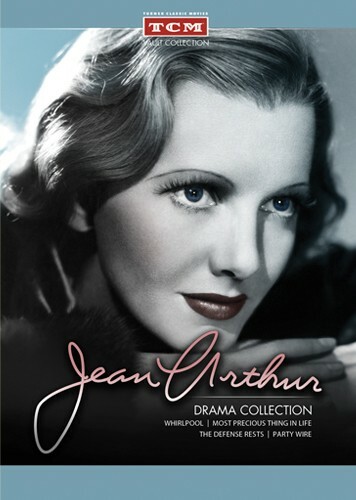 A Jean Arthur box set might be easily overlooked by the casual horror fan, but a closer look reveals that two of the films contained in Sony/TCM's JEAN ARTHUR DRAMA COLLECTION ($39.99) were directed by Lambert Hillyer (DRACULA'S DAUGHTER), while the other two are the work of Roy William Neill (FRANKENSTEIN MEETS THE WOLF MAN) and Erle C. Kenton (ISLAND OF LOST SOULS, HOUSE OF FRANKENSTEIN). Tonight, I watched the first film in the set -- Neill's WHIRLPOOL (1934, review forthcoming on my Pause. Rewind. Obsess. blog) -- and it's fantastic. Now I'm excited about cozying up with the other three. It's a TCM website exclusive from Sony. First Look: VIDEO WATCHDOG #168! Read all about it... here. This is the striking original Enrico De Seta artwork commissioned for the due-foglia poster for Il fantasma di Soho, the Italian release of THE PHANTOM OF SOHO, a.k.a. the German krimi Das Phantom von Soho (1964). Though I don't find the sketchy execution of the work quite as ideal as much of De Seta's other poster art, I still find it to be an uncommonly haunting image and wonder from where it came in the artist's fevered imagination. It doesn't capture the atmosphere of Franz-Josef Gottlieb's highly visual, black-and-white film, nor its masked menace, a skull-faced killer wearing what appear to be glittery oven mitts, but the model is clearly based on cast member Helga Sommerfeld, who plays an employee at the Club Zanzibar. What this image does recall, curiously enough, is the exhilarating horror of a film made almost 15 years later: the first murder in Dario Argento's SUSPIRIA (1977), when the disembodied demonic arms emerge from darkness to repeatedly plunge a long knife into the chest of ballet student Pat Hingle (Eva Axén). It would not be unreasonable to suspect that Argento, as a young man devoted to the Edgar Wallace/Bryan Edgar Wallace krimis, would have made a point of seeing this picture and spend some time in the lobby admiring and absorbing this image, enabling him to subconsciously exceed its brilliance onscreen more than a decade later. You can get a rough idea of how De Seta's artwork was adapted to poster form in this photo, originally posted by Daniel N on the AVI Maniacs boards. I bet it sold tickets and, it goes without saying, it would never get past the severe limitations that control film advertising today.